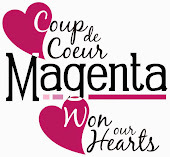 Magenta: Magenta's Blog Makeover / Le Blog Magenta se refait une beauté! Magenta's Blog Makeover / Le Blog Magenta se refait une beauté! don't worry they will come back! and will be back more dynamic than ever! ne vous en faites pas ils vont revenir! Le blog se transforme et sera plus dynamique que jamais! Sounds exciting! Looking forward to it! Looking forward to see the completed makeover!